Aluminum is an important item that must be recycled. At All Green Electronics Recycling we perform professional aluminum recycling with industry-standard practices. Great strides have been taken to recycle aluminum in the U.S., but we must do more! Choose All Green Electronics Recycling as your preferred aluminum recycler and we will ensure that every scrap of aluminum is recycled and put to good use. We are one of the largest recyclers in the U.S, trusted by thousands of businesses across the country. The problem of electronic equipment disposal is only complicated when we use a single process of recycling for all type of devices. Thus we employ a very device-specific ITAD strategy which is economic for companies as well as much better for the environment. Reusing equipment after refurbishing and reselling it is a good source of extra revenue. Another good strategy is to extract and recycle valuable metals like aluminum from the devices. We have very specific protocol for every type of equipment recycling process which will yield the best results for everyone. We have the largest number of trucks in North America specially dedicated to IT recycling, therefore we can pick up aluminum from your doorstep in a very cost effective manner. All the involved processes including packaging and labeling are handled by our recycling experts. We also maintain an advanced online portal which lets you track your equipment at any time. Hence the whole process is easy and effective. We are certified in important data handling with a long record history for assuring integrity in cases of confidential information. As a dedicated e-recycling agency, we are trusted by business on a daily basis. We are proud to hold certifications like R2 Responsible Recycling, ISO 14001 – all of which are highest certifications in recycling business. All equipment goes through careful management at every step of the process, with all data being transparently available to you at all times. The laws for recycling metals like aluminum are strict and can impose hefty fines which will not only be harmful to the business, but will damage the reputation of your company as well. We go way above the minimum guidelines specified by the government and also make sure that every smallest bits of items are recycled, which protects your company from any risk while simultaneously helping to create a better, sustainable tomorrow. Aluminum is a 100% recyclable and sustainable metal. 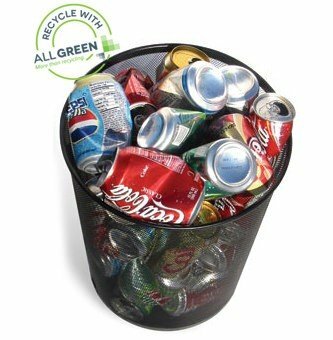 Aluminum can be turned over from a store shelf to the recycling bin and back to the store shelf in as little as 60 days. Every minute, 123,097 aluminum cans, or 2 out of every 3 cans, are recycled. Aluminum is one of the only recyclables that more than pays for its own recycling. Because of the sustainable nature of aluminum, the size and economic impact of the aluminum recycling industry is notable, with more than 155,000 workers directly employed in the industry and 3.3 additional supporting positions created for each worker directly employed. We’re All in for Aluminum! Aluminum began to be mass marketed in the United State in the early 1900s, in applications such as packaging and foil. Nearly 75% of all aluminum produced in the U.S. in the last 100 years remains in use. Companies that utilize aluminum in their packaging have been shown to have a competitive advantage due to attracting consumer goodwill. Aluminum is valued by consumers for its ease of use, safety, convenience, lightness of weight and durability. The highly printable surface of aluminum easily accepts paint and coatings, making it ideal for brand identification and visual appeal. • Recycling is a key operation in the aluminum industry, with the United States and Canada recycling more than 5 million tons of aluminum annually. • Aluminum recycling is 92% more energy efficient than producing new aluminum, making recycling both business and environmentally friendly. • A 10% increase in recycling aluminum at the end of its life decrease greenhouse gas emissions by 15%. • Nearly 40% of the North American supply of aluminum is created through recycling processes, increasing from 30% in the early 1990s. • Producing aluminum from recycled metal conserves more than 90% of the energy required for the primary production of aluminum. • 20 aluminum cans can be recycled with the same amount of energy it takes to create just one can from virgin ore. With all of the encouraging statistics about aluminum recycling, it is disheartening to learn that every three months, enough aluminum is thrown into landfills to rebuild the entire commercial air fleet of the United States. 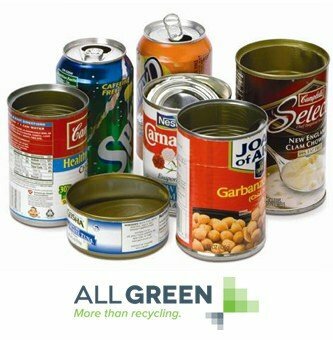 36 billion cans, with a commercial value of more than $600 million were thrown into landfills last year. There is a better way of disposing of aluminum than discarding it in landfills. We are committed to responsible and environmentally sound recycling practices which protect our planet. If you have aluminum available for recycling, you can drop it off at one of our nationwide pick-up centers, or we can arrange to pick it up for free. Our customers can track the progress of their recyclables on our website. At All Green Electronics Recycling we strive to repair and reuse materials which can be salvaged, and will recycle those that cannot be salvaged so that they can be made into new materials at a greatly reduced carbon footprint. Customers can receive payment for their recyclables. Our customers can also feel good knowing we perform recycling in an ethical manner – we never ship items to pollute the landfills of third world countries, as do some of our competitors. We’re here to be part of the solution.